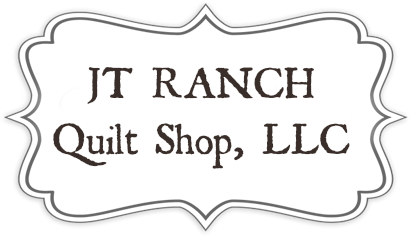 JT Ranch Dry Goods was located on the Choate Ranch , 12 miles west of Cisco, Texas and 17 miles east of Albany, Texas, owned and operated by the Choate Family. The brand, JT, used by the store is a registered brand used by the Choate family for over 75 years. The services at the store include longarm quilting, monogramming and screen printing. Classes for adults include beginning sewing and quilting classes, traditional quilting classes, Block of the Month, Mystery Quilting Class, etc. . Classes for kids include "Kids Sew Cool Sewing Camp" and "Kids Club". Western fabric as well as fabric lines from Moda, Rilet Blake, Maywood, as well as other lines are included in the fabric line up. The store has recently relocated to Cisco, Texas at 706 Conrad Hilton. It was neccessary to locate to a larger building. The facility holds over a 2000 bolts of fabric, gift shop, florist, production area for embroidery and longarm quilting, and a classroom and demonstration area. Future plans are to have a 4000 sq ft retreat/bed and breakfast and event area.